Patras is 215 km (134 mi) west of Athens by road, 94 km (58 mi) northeast of Pyrgos, 7 kilometres (4 miles) south of Rio, 134 km (83 miles) west of Corinth, 77 km (48 miles) northwest of Kalavryta, and 144 km (89 mi) northwest of Tripoli. A central feature of the urban geography of Patras is its division into upper and lower sections. This is the result of an interplay between natural geography and human settlement patterns; the lower section of the city (Kato Poli), which includes the 19th-century urban core and the port, is adjacent to the sea and stretches between the estuaries of the rivers of Glafkos and Haradros. It is built on what was originally a bed of river soils and dried-up swamps. The older upper section (Ano Poli) covers the area of the pre-modern settlement, around the Fortress, on what is the last elevation of Mount Panachaikon (1,926 m (6,319 ft)) before the Gulf of Patras. The largest river in the area is the Glafkos, flowing to the south of Patras. Glafkos springs in Mount Panachaikon and its water is, since 1925, collected in a small mountainous reservoir-dam near the village of Souli and subsequently pumped in order to provide energy for the country's first hydroelectric plant. Other rivers are Haradros, Meilichos and the mountain torrent Diakoniaris. Of great importance for the biological diversity of the area and the preservation of its climate is the swamp of Agyia, a small and coastal aquatic ecosystem of only 30 ha (74 acres), north of the city centre. The main features of this wetland are its apparent survival difficulty, being at the heart of a densely populated urban centre that features a relatively arid climate and its admittedly high level of biodiversity, with over 90 species of birds being observed until the early 1990s, according to a study by the Patras Bureau of the Hellenic Ornithological Society. Another geophysical characteristic of the region is its high level of seismicity. Small tremors are recorded along the coast of Patras almost constantly. Larger earthquakes hit the area every few years with potentially destructive effects. In 1993, a 5.0-magnitude earthquake caused some damage to several (mostly older) buildings throughout Patras due to the proximity of the epicenter to the city. On June 15, 1995, a 6.2-magnitude earthquake hit the nearby town of Aigion, also causing some structural damage to a few buildings in Patras. The Ionian Islands are also frequently hit by even more severe earthquakes, some of which can be felt in the city. In antiquity, the most notable example of destruction caused by an earthquake in the region was the total submergence of the ancient Achaean city of Helike, now Eliki. View of the Patras Castle, built during the Byzantine era. The first traces of settlement in Patras date to as early as the third millennium BC, in the area of modern Aroe. Patras flourished for the first time in the Post-Helladic or Mycenean period (1580–11). Ancient Patras was formed by the unification of three Mycenaean villages in modern Aroe; namely Antheia (from mythological Antheia) and Mesatis. Mythology has it that after the Dorian invasion, a group of Achaeans from Laconia led by the eponymous Patreus established a colony. In antiquity Patras remained a farming city. It was in Roman times that it became an important port. After 280 BC and prior to the Roman occupation of Greece, Patras played a significant role in the foundation of the second "Achaean League" (Achaiki Sympoliteia), along with the cities of Dyme, Tritaea and Pharai. Later on, and following the Roman occupation of Greece in 146 BC, Patras played a key role, and Augustus refounded the city as a Roman colony in the area. In addition, Patras has been a Christian centre since the early days of Christianity, and it is the city where Saint Andrew was crucified. In the Byzantine era Patras continued to be an important port as well as an industrial centre. One of the most scholarly philosophers and theologians of the time, Arethas of Caesarea was born at Patrae, at around 860. By the 9th century, there are strong signs the city was prosperous: the widow Danielis from Patras had accumulated immense wealth in land ownership, the carpet and textile industry, and offered critical support in the ascent of Basil I the Macedonian to the Byzantine throne. In 1205 the city was captured by William of Champlitte and Villehardouin, and became a part of the principality of Achaea. It became the seat of the Barony of Patras, and its Latin archbishop primate of the principality. In 1408, Patras became Venetian, until it was recaptured in 1430 by the Despotate of Morea and its despot Constantine Palaiologos, who thus succeeded in recovering for the Byzantine Empire the whole of the Morea, apart from Venetian possessions. The administration of Patras was given to George Sphrantzes, while Constantine was immediately contested by the Ottoman Empire and later, in 1449, became emperor of the Byzantine empire. Patras remained a part of the Despotate of Morea until 1458, when it was conquered by the Sultan of the Ottoman Empire, Mehmet II. 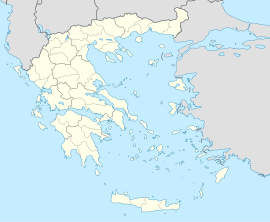 Under the Ottomans, it was known as Baliabadra, from the Greek Παλαιά Πάτρα ("Old Patras"), as opposed to Νέα Πάτρα, the town of Ypati in Central Greece. Though Mehmet granted the city special privileges and tax reductions, it never became a major centre of commerce. Venice and Genoa attacked and captured it several times in the 15th and 16th centuries, but never re-established their rule effectively, except for a period of Venetian rule in 1687–1715. Surrender of Patras to General Schneider by Hippolyte Lecomte. View of King George I Square in the late 19th century. Patras was one of the first cities in which the Greek Revolution began in 1821; the Ottoman garrison, confined to the citadel, held out until 1828. Finally the city was surrendered on 7 October 1828 to the French expeditionary force in the Peloponnese, under the command of General Maison. After the war, most of the city and its buildings were completely destroyed. The new city was planned under the supervision of Stamatis Voulgaris after orders by Ioannis Kapodistrias. Patras developed quickly into the second-largest urban centre in late-19th-century Greece. The city benefited from its role as the main export port for the agricultural produce of the Peloponnese. In the early 20th century, Patras developed fast and became the first Greek city to introduce public streetlights and electrified tramways. The war effort necessitated by the first World War hampered the city's development and also created uncontrollable urban sprawl after the influx of displaced persons from Asia Minor after the 1922 population exchange between Greece and Turkey. In the Second World War the city was a major target of Italian air raids. In the Axis occupation period, a German military command was established and German and Italian troops stationed in the city. After the liberation in October 1944, the city grew fast to recover, but in later years was increasingly overshadowed by the urban pole of Athens. The city is divided into the upper and the lower section, connected with roads and broad stairs. The upper section (Ano Poli) is the older and the more picturesque; however, the lower section (Kato Poli) is laid out according to the 1858 city plan, featuring a variety of squares. The most notable of these are the Psila Alonia and the Georgiou I Square. A number of notable neoclassical buildings are to be found, including the Apollon Theatre in Georgiou I Square, the 'Town Hall, the headquarters of the Local Trade Association and the Court of Justice. A replica of Patras Lighthouse, the city's emblematic old lighthouse - which was at the dock of Ayios Nikolaos - rises at the end of Trion Navarhon street, near the temple of Saint Andreas. In general, much of Patras' coastline is framed by roads and avenues running alongside; these include Dymaion Coast to the south and Iroon Polytechneiou Road to the north. Saint Andrew Church, patron saint of the city. Trion symmachon Square with the old hotel Metropolis in the background. The entrance of the new Archaeological Museum of Patras. The Roman Odeon, the most significant ancient monument, is in the upper town and was built around 160 AD, in the reign of either Antoninus Pius or Marcus Aurelius. It has been restored and partially reconstructed, and is used as an open-air theatre for performances and concerts in the summer. 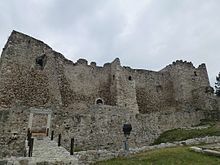 The medieval Patras Castle, in the ancient acropolis overlooking the city, was initially built in the 6th century AD by the Byzantine emperor Justinian, having many additions from the period of the Frankish and Venetian rule of the city, up to as far as the time of the Despotate of Morea and later the Ottoman Empire. Its current outline dates back to the second Venetian rule of the town (1687–1715). Today, its interior is used as a public garden. The Roman Amphitheatre, near the Roman Odeon, in Ifestou street, dating from the 1st century AD, at a period of the biggest development of Roman Patras. Its area has been only partially excavated. The church of Saint Andrew of Patras was founded in 1908 by King George I and was inaugurated in 1974. It is dedicated to Saint Andrew, the patron of the city. It is the second-largest temple of Byzantine style in the Balkans (after the Cathedral of Saint Sava in Belgrade). The central cupola is 46 m (151 ft) tall and is the base for a 5-metre (16 ft) gold-plated cross and twelve smaller ones, symbolising Christ and the twelve apostles. A congregation of at least 5,000 can attend a sermon within the church. The municipal Theatre Apollon, built in 1872 to plans by the German architect Ernst Ziller. The building is characteristic of the 19th-century neoclassical style and is in the central square of the city. The Achaia Clauss wine industry and tasting center, which is on the outskirts in Petroto village. It was founded in 1861 by the Bavarian Gustav Clauss and is most famous for its Mavrodaphne. The Patras Archaeological Museum exhibits the history of Patras from the prehistoric era to the late Roman period. The Roman aqueduct that led from the springs of Romanos to the acropolis. The aqueduct measured 6.5 km (4.04 mi) from the water cistern to the castle. For the greater part of this distance, the water passed through an underground channel, passing over valleys and gorges on carefully constructed archways, parts of which still stand, in the area of Aroi. The Turkish baths building (16th century), still retain their initial use, and are one of the oldest Turkish baths surviving in Europe. The Patras Lighthouse, a reconstructed "Faros" (Lighthouse), which is the symbol of the city. The Agiou Nokolaou Stairs, Gerokostopoulou Stairs, Patreos Stairs and Trion Navarchon Stairs, outdoor grand staircases all over the centre of the city dividing the upper town from downtown. Georgiou I Square, the central square and the heart of the city. It was named after king George I. The square's fountains were installed in 1875 at a cost of 70,000 drachmas each, a huge amount for the finances of Greece and Patra at the time. It was and continues to be the center of political and cultural life in the city, hosting all significant activities, political gatherings, rallies, cultural events and, most importantly for some, its carnival. Ethnikis Antistaseos Square (Olga's Square) is known by the name of queen Olga, wife of king George I, and was planted with trees bearing the name "The queen's garden". Today the square is officially known as Ethnikis Antistaseos, but its old name (Olga's Square) is the one in most regular use. Trion Symmahon Square bears the name of the three Allied Powers who fought for the liberation of Greece; Britain, France and Russia. 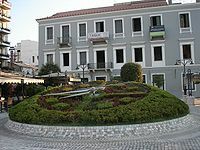 The square features a flower clock and links the Ayiou Nikolaou pedestrian way with the seaside front and the dock of Ayios Nikolaos. 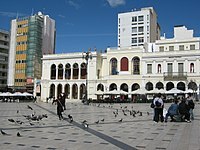 Psilalonia Square (Greek: Ψηλαλώνια or formally Πλατεία Υψηλών Αλωνίων) is one of Patras's most popular squares. It is 1.5 km (0.93 mi) from downtown Patras, next to the city's main north-south street, Gounari Street. It features a fountain, many sidewalks, palm trees and playgrounds. A bronze statue of Germanos of Patras stands on the northern end, while a memorial plaque to people executed in the Axis occupation of Greece stands on the south-western corner. It is surrounded by several shops, restaurants and cafes and a number of modernist buildings. It was completed in the mid-to-late 19th century, when trees were added, along with neoclassical buildings. After World War II and the Greek Civil War, however, and through the 1960s and 1970s, most neoclassical buildings were replaced by eight-storey residential buildings. In the west end, a 15-metre-tall (49 ft) cliff overlooks the Trion Navarchon pedestrian street, and offers a wide vista across the western Gulf of Patras, including the mountains of Aitoloakarnania. The Spinney of Patras (Greek: Δασύλλιο), is in a pine-tree-covered hill, which is dubbed "the Gulf of Patras' veranda" because of the panoramic view it offers. The spinney is ideal for recreational walks and jogging, with its specially formed paths and the shade offered by the tall trees. The pine trees that cover the spinney were planted in March 1916 by students of Patras' primary schools under the supervision of the Austrian forest specialist Steggel. Kolokotroni street in central Patras. As a part of the 2006 European Capital of Culture programme, there was a project for the restoration of the city's architectural heritage. Patras' center is characterised by a composition of architectural currents and trends. Α representative example are the façades around the central square of the city (Georgiou I square). The neoclassical Apollo Theatre, a work of Ernst Ziller, is next to the modernist building of the Hall of Literature and Art (Μέγαρο Λόγου και Τέχνης). Today's Patra is a relatively newly built city, as its medieval buildings were completely destroyed in the Greek War of Independence. The oldest surviving buildings (apart from ancient monuments and the castle) are the church of Pantocrator in Ano Poli and a residential building (Oikia Tzini) at the corner of Ayiou Nikolaou and Mezonos street, built in 1832. The area on the south of the castle, around the Roman Odeon and the church of Pantokrator, in the Upper Town (Ano Poli), is the most appealing of the city, because of its status as the only area where construction height is limited to two-storey buildings. The first city plan of Patras, 1829. Administrative region of Western Greece. Patras is the regional capital of Western Greece and the capital of the Achaea regional unit. Since 2011, the city is also the capital of the administrative division, which includes (along with Western Greece) the regions of Peloponnese and the Ionian Islands. Patras municipality within the region of Western Greece. Patras municipality (Dimos Patreon) and its municipal units within the regional unit of Achaea. The municipality has an area of 334.858 square kilometres (129.289 square miles), the municipal unit 125.420 square kilometres (48.425 sq mi). The following list presents demographic data on the municipality of Patras over the years 2012. Population of Patras (dark blue) and urban area of Patras (blue) from 1853 to 2007. From 2011 on, can data also reflect the city's urban area population, as all the municipalities that made up the Patras Urban Area were joined to create the new larger Patras municipality, formed at the 2011 local government reform. Heavy infrastructure works performed in the 2000s include the Peiros-Parapeiros dam (to provide water supply for Patras and surrounding towns) and a "small industries" park that will be constructed next to the Glaykos river and provide an easy connection with the new port. The city is one of the main Greek internet and GRNET hubs and is connected with high speed lines to Athens as part of the backbone. A metropolitan optical network will be deployed in the city, with a total length of 48 km (30 mi). Two major state hospitals operate in the city: the Agios Andreas Hospital is the oldest of the two; and General University Hospital of Patras. There also exists two smaller state hospitals, Karamandanio - a children's hospital, and the Center of Chest Diseases of Southwestern Greece. A large range of private hospitals and clinics operate in parallel. 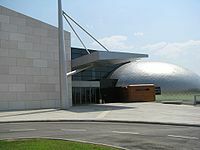 Numerous art venues and an ultra-modern archaeological museum were constructed for the needs of European Culture Capital designation. The cultural and educational facilities include the Municipal Library, the university libraries, many theatres, the municipal art gallery, the University of Patras's facilities, the Hellenic Open University and the Technical Institute of Patras. A number of research facilities are also established in the university campus area. Exportation of raisin; port of Patras, 19th century. The University of Patras with the Rio-Antirio bridge in the background. The economy of the city largely depends on its service sector. Its main economic activities include retailing, logistics, financial and public sector services. Patras suffered a severe problem of deindustrialisation in the late 1980s and 1990s; a number of major productive units shut down in successive order. As a result, a considerable portion of the city's workforce and the city's economic planning in its entirety had to be re-evaluated and restructured by the authorities giving emphasis on the science sector. The University of Patras contributed by working towards this goal, using its service and technology sectors. Most Greek banks have their regional headquarters for Western Greece in Patras. In 2010, the new Infocenter of Patras was established, inside the neoclassical building of the former market "Agora Argyri", in Ayiou Andreou street. The building includes a conference hall, along with multi-purpose and exhibitional spaces. The regional unit of Achaea has about 4,800 hotels rooms and in 2006, 286,000 tourists, mainly from Greece, stayed in the area for a total of 634,000 days. Patras still has a large manufacturing base for a variety of industries. Titan Cement Company operates a large cement factory, with a private port, in Psathopyrgos, a suburb of Patras. Patras hosts several timber manufacturing companies, and a wood distribution center of Shelman. The largest local company is Abex. The paper sector is also active including a paper factory belonging to Georgia-Pacific (Delica) and two important Greek companies, Elite and El-pack, headquartered in the city. Patras has several packing and industrial equipment companies. The most important of them are the local Antzoulatos and the multinational Frigoglass, a subsidiary of Coca-Cola, headquartered in the suburbs of Patras. Ideal Bikes is the leading bike producer in Greece, with large export activities. CBL is headquartered in Patras, while Vianex - owned by Pavlos Giannakopoulos - has its largest production facilities in the industrial area of the city. The once omnipresent textile industry of the city is now almost defunct after the shut-down of the huge factory of Peiraiki-Patraiki (Πειραϊκή-Πατραϊκή), followed by numerous smaller textile industries. This had an important impact on the city's economy and resulted in high levels of unemployment in the 1990s. The remains of the facilities, still cover hundreds of acres in the south side of the city. Patras companies also focus in dress production, the most important among them being DUR. Inside the Achaia Clauss wine factory, founded in 1861 by Gustav Clauss, famous for its Mavrodaphne. Some of the largest industries in the city belong to the soft drinks and drinks sector. There are factories from Coca Cola HBC and Athenian Brewery established in area, along with the facilities of the largest local company in soft-drinks production, Loux (ΛΟΥΞ). The city is also home to many leading Greek wineries and distilleries, among them the venerable Achaia Clauss and Parparoussi located in Rio. In the food sector, Friesland Foods, through the local subsidiary NoyNoy, operates a new yogurt factory in the city's industrial area. Patras is also home to important fish-farming companies (Andromeda, Nireus). ECOFEED operates in the industrial zone of Patras, the largest fish-feeds factory in the Mediterranean. The city hosts the second-largest flour-mills in Greece, Kepenou-Mills. View of the wind park on Panachaiko mountain. Acciona has completed the largest wind park in Greece, on the Panachaiko mountain, overlooking the city of Patras. The Public Electric Company, operates a small hydroelectric plant on river Glafkos. Intracom facilities in Patras house the offices of Telecommunications Software Development, Terminal Equipment Design, Development Programmes, and Support Services divisions. Expansion plans have recently been completed. The Corallia Innovation Hub, Innohub hosts many companies focusing on Microelectronics. Patras Science Park is an incubator for many small but upcoming technology companies. Nobacco, a Greek electronic cigarette brand, works mainly with cooperation with the university of Patras. There has been a significant development in the R&D sector, in the last few years, as a result of the many research institutes and the University impact in the area. The Computer Technology Institute and the Industrial Systems Institute of Greece are headquartered in Patras. The city is also a host to the FORTH-ICE-HT (Institute of Chemical Engineering & High Temperature Chemical Processes) and the Institute of Biomedical Technology. Apollon Theatre, designed by Ernst Ziller. Patras Carnival; the float of the "King of the Carnival". Gerokostopoulou street during the Patras Carnival. The cultural activity of Patras includes the Patras International Festival (with various artistic activities, mainly in the fields of theatre and music), the Patras Carnival and the Poetry Symposium. The city hosts many museums, including the Patras Archaeological Museum, the History and Ethnology Museum, the Folk Art Museum, the Press Museum and the Technology Museum, the latter in the campus of Patras University. Other cultural institutes are: the Visual Arts Workshop, the icon painting school, the Carnival Float Workshop, the Municipal Library, the Municipal Gallery, along with many private art galleries. The architectural heritage of the city is dominated by neo-classicism, but also includes structures from other periods. Patras is also a pilot city of the Council of Europe and EU Intercultural cities programme. 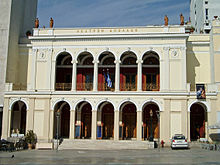 The Patras Municipal and Regional Theatre was founded in June 1988, having as its main stage the city's landmark, the Apollon Theatre. Throughout its existence it has mounted critically acclaimed performances ranging from ancient dramaturgy and modern Greek, to international repertoire. The theatre cooperates with other theatrical groups, such as the Viomichaniki (Industrial) group and the Michani Technis (Art Machine). The Roman Odeon hosts ancient dramas in the summer, while the Pantheon theater, the Art Factory, the Lithographeion and the Agora theatres provide additional venues. The International Festival of Patras takes place every summer, with a program consisting mostly of plays—both ancient drama and modern theatre—as well as various musical events. Patras has also a very strong indie rock scene with critically acclaimed bands such as Raining Pleasure, Abbie Gale, Serpentine, Doch an Doris and others. The city is also the birthplace of Karagiozis (shadow theatre) in Greece, with Dimitris Sardounis as founder. In addition, there are several conservatoires and music schools, including one devoted exclusively to Byzantine music, several orchestras and choirs. There are also a number of dance schools, and there are plans to set up a dance theatre within the context of the Patras Municipal and Regional Theatre. The latter hosts a full-time professional theatre group, while there are several amateur groups performing in the city. The Patras Carnival (Patrino karnavali) is the largest event of its kind in Greece and one of the biggest in Europe, with a heritage reaching back 160 years. The events begin in January and last until Clean Monday. The old paper factory of Ladopoulos hosted a series of exhibitions for the European Capital of Culture. Patras was chosen by the European Commission to be the European Capital of Culture for the year 2006. The concept of the event revolved around the main theme of "Bridges" and "Dialogues", drawing benefit from the city's rich history and its position as a "Gate to the West", to underline the essence of the productive interaction of culture and civilisations in Europe. The EU Commission found Patras' plans very ambitious and also commented that a successful hosting of the title by a medium-sized city would make it possible to redefine the meaning of the term Cultural Capital. The current cultural activity of the city includes the Patras International Festival (various artistic activities, mainly in the field of music), the Patras Carnival and the Poetry Symposium (organised each year for the 25 years by an ad hoc committee at the University of Patras). The Patras 2006 proposal focuses on two central ideas: "bridges" and "dialogues". Cultural managers from Patras and the general public will be involved in developing these ideas. Further, four poles/programmes of cultural attraction will be developed. The first, "A city for Europe", will relate to the architectural heritage, the industrial revolution and similar subjects. "The counterpart cities" programme will be developed in the fields of human and social sciences and in diverse artistic fields. "The three sea battles" will present a cultural programme focusing on peace and understanding. The last theme, "The many homelands", is directly linked to the etymology of the name of the city. This programme will among other things concentrate on art workshops, the transfer of know-how, way of life and entertainment. In 2006 various cultural events were held in the context of the European Capital of Culture. Among the artists presenting their work in Patras were: Gary Burton, Maxim Shostakovich, Ian Anderson - with the Patras Municipal Orchestra, Jean Louis Trintignant, Roberto Benigni, Eros Ramazzotti and José Carreras. With the completion of the Capital of Culture programme, a part of the old Ladopoulos factory was renovated to host exhibitions, a small theatre (named the Art Factory), was built and a number of neoclassical buildings around the city were renovated as part of a plan to preserve the city's architectural heritage and link it to its cultural life. The new Archaeological museum was completed in 2009. Its globe-like roof and modern architectural design enhances the town's northern entrance, taking its place among the other city landmarks. Kostas Davourlis Stadium of Panachaiki G.E. Patras International Circuit for kart racing. Patras has several sports facilities and important teams in almost all the major Greek leagues. Panachaiki Gymnastiki Enosi, Apollon Patras, E.A. Patras and NO Patras are historically the major sports clubs based in the city, specialising in football, basketball, volleyball and water polo. The city's national stadium, Pampeloponnisiako Stadium, was renovated and expanded in 2004. Since 2009, a new event, the Patras International Circuit Kart takes place every September, turning the city streets into a circuit. The city has hosted several international sports events, such as the 1995 Basketball Under-21 World Championship (preliminaries), the 1995 Men's European Volleyball Championship (preliminaries), the 1997 Rhythmic Gymnastics European Championships, the 2001 World Wrestling Championships, the 2003 European Women Basketball Championship, the 2003 International Children's Games, a group stage of the football tournament in the 2004 Olympic Games, the 2007 World Rhythmic Gymnastics Championships, the 2008 World Deaf Football Championships and the 2019 Mediterranean Beach Games. The Anglican Church of Saint Andrew. The city is the seat of the Greek Orthodox Metropolis of Patras. As in the rest of the country, the largest denomination is the Orthodox Church, which represents the majority of the population. There is also a sizeable living community of Roman Catholics. The most significant church in the city is the church of Saint Andrew, in the south west of the city center. The construction of the church began in 1908 under the supervision of the architect Anastasios Metaxas, followed by Georgios Nomikos. It was inaugurated in 1974. It is the largest church in Greece and the third-largest Byzantine-style church in the Balkans, after the Cathedral of Saint Sava in Belgrade and Alexander Nevsky Cathedral in Sofia. It holds relics of Andrew the Apostle, which were returned to the city of Patras from St. Peter's Basilica, Rome in September, 1964, on the orders of Pope Paul VI. The old church of Ayios Andreas (1836–1843), next to the new temple. Situated in the site of Andrew the Apostle's martyrdom, it was built in basilica style by the architect Lysandros Kaftantzoglou. The first Jewish presence in the city was dated back to the Hellenistic era (see Romaniotes). After the WWII, the community almost disappeared and the last synagogue closed in 1950. There is a district of the city, named Evreomnimata, where the old Jewish cemetery was located. The city boasts an impressive number of politicians in the national political arena as its natives, greater than any other Greek city; significant personalities shaping the character of Greece were and are associated with Patras. Its famous natives include the prime ministers Dimitrios Gounaris, the main leader of the anti-venizelist party in the 1910s, Stylianos Gonatas, a high-ranking officer, politician and one of the leaders of the "1922 Revolution", Andreas Michalakopoulos, a prominent liberal party cadre, foreign minister and prime minister, and Dimitrios Maximos, a distinguished economist, minister and finally prime minister in the civil war era. More recent figures include the Papandreou family, arguably the most influential in post World War II Greece, Panagiotis Kanellopoulos, the last democratically elected head of government before the establishment of the 1967 junta, and Costis Stephanopoulos, the former president of the Hellenic Republic. Ikarus Palace of Minoan Lines at the port. The city has always been a sea-trade hub because of its strategic position. The port manages more than half of the foreign sea-passenger transportation in Greece, and has excellent car-ferry links with the Ionian islands and the major Adriatic ports of Italy. Additionally, a new port is under construction in the southern section of the city to accommodate the increased traffic and relieve the city centre from port operations. In 2011, the new harbour (southern port) went into operation. Ferries to Italy now dock there. The port is connected by a number of daily routes to the Ionian islands Kerkyra, Kefallonia and Zakynthos, to the port of Igoumenitsa and to the Italian cities Ancona, Bari, Brindisi, Trieste and Venice. Seaplanes also operate. A newly constructed, 20-kilometre (12 mi) ring road (the Bypass of Patras) was first opened in 2002 in order to alleviate heavy traffic throughout the city. A mini ring road (known as the "Mini bypass" of Patras) is now being constructed to alleviate heavy traffic-related problems in the city centre. Two large highways are under construction that will connect the seacoast and the new port with the Bypass of Patras. The first is over the small Diakoniaris river (from Eleftheriou Venizelou street until the Bypass'es exit in Eglykada), while the second consists of two roads, 4 km (2 mi) each, that will run in parallel with the Glafkos river. Another project will lead to an additional entrance to the downtown area by expanding Kanakari street. The highway connection with Athens and Pyrgos is to be greatly upgraded. Patras will also be the central hub of the Ionia Odos highway, intended to bridge western Greece from Kalamata to Ioannina. The Rio-Antirio bridge is north of the city and links Peloponnese to mainland Greece, and was completed in August 2004. Patras is bypassed by the Olympia Odos (A8) motorway, which is also part of the E55 route that crosses the Rio-Antirio Bridge, dominating the sealine across the Gulf of Corinth. A rudimentary single, narrow gauge railway track crosses the city and connects it to Rio. In the past regional rail links were provided by the Hellenic Railways Organisation, connecting Patras to Athens and Piraeus as well as to Pyrgos and Kalamata. OSE announced the suspension of all the rail service in the Peloponnese on January 2011 so today (2018) the railway track is in use only by suburban trains that connect Patras with the adjacent villages of Rion and Agios Vasileios. The central passenger train station of Patras which is a small building constructed in 1954, lies to the west of the downtown area, between Othonos-Amalias Avenue and the north port. The main freight station of Aghios Andreas lies further to the south, next to the homonymous church and it is not in use any more. Finally, the old depot of Aghios Dionysios, consisting of about ten tracks, offers basic turntable and roundhouse facilities; it is about 400 m (1,312.34 ft) long. A new double standard gauge railway line to Korinth and further to Athens is under construction. The construction works are currently (2018) in progress close to the suburbs of Patras, but the remaining few Kilometres till the city centre and the new port are still under study because of various financial and technical problems. Within the city of Patras is served by buses. There are two transport lines to and from the University of Patras, and some nearby lines to the city suburbs, like Saravali, Zarouchleika, Paralia. Commuter rail services have recently been established by Proastiakos, with one line currently connecting Patras, Rio and Agios Vasileios. Regional bus links are provided by KTEL, connecting the city to almost the entire Greek territory and to places inside the province of Achaea. Seasonal air transport is provided at Araxos Airport, about 40 km (25 mi) from the city. Patras is a pilot city of the Council of Europe and the European Commission Intercultural cities programme. Patras was selected as main motif for the €10 Greek Patras 2006 commemorative coin, minted in 2006. This coin was designed to commemorate an event signalling an enlightened course for Patras and serving as a reminder of the way in which culture can stimulate the economy and promote development, when Patras was appointed European Capital of Culture. On the obverse is the logo for Patras 2006 around the words "European Capital of Culture". The house where Kostis Palamas and Matilde Serao were born. ^ a b c d "Απογραφή Πληθυσμού - Κατοικιών 2011. ΜΟΝΙΜΟΣ Πληθυσμός" (in Greek). Hellenic Statistical Authority. ^ Mansfield, Paul (29 January 2006). "Party town gets a culture kick". Retrieved 6 September 2017 – via The Guardian. ^ "Region of Western Greece: Geography". Ditikiellda-region.com. Archived from the original on September 27, 2007. Retrieved February 9, 2007. ^ "Climate of Patras". Hellenic National Meteorological Service. Archived from the original on 18 March 2012. Retrieved 28 February 2013. ^ Chris K. "Hellenic Ornithological Society - Birds, birding and conservation in Greece". Ornithologiki.gr. Archived from the original on December 25, 2008. Retrieved 2009-01-05. ^ Strategus Makrygiannis. ""Memoirs", Book A, Chapter I, Athens, 1849". Retrieved 2012-10-02. ^ Kounenaki Pegy. "19th Century Patras: how the character of the city changed with the development of the port after 1828". News.kathimerini.gr. Archived from the original on 2012-02-15. Retrieved 2012-10-02. ^ "RC - Patras, Restoration and preservation of the Roman amphitheatre of Patras". Iiinstitute.nl. Archived from the original on 2012-03-27. Retrieved 2012-10-02. ^ "Info about St.Andrew Church". InfoCenterpatras.gr. Archived from the original on 2011-10-05. Retrieved 2012-10-02. ^ "Άγιος Ανδρέας". e-patras.gr. Archived from the original on 2012-08-02. Retrieved 2012-10-02. ^ Mentzini, Marilena. "Patras' Roman Aqueduct -Restoration". Retrieved 6 September 2017. ^ "Ρωμαϊκό Υδραγωγείο". e-patras.gr. Archived from the original on 2012-07-30. Retrieved 2012-10-02. ^ "WESTPOINT - Mια αρχιτεκτονική βόλτα στην Πάτρα". Westpoint.gr. Archived from the original on 2012-03-26. Retrieved 2012-10-02. ^ Loizos Bailas, Mixalis Kaplanidis. "MHXANIKH AE". Michaniki.gr. Archived from the original on 2007-09-28. Retrieved 2009-01-05. ^ "Metropolitan Optical Network of Patras". Ru6.cti.gr. Archived from the original on 2009-01-16. Retrieved 2012-10-02. ^ "European Culture Capital, Patras Venues". Patras2006.gr. Archived from the original on 2007-07-23. Retrieved 2012-10-02. ^ "Ktizon, Presentation of the Archaeological museum of Patras". Ktizon.blogspot.com. Retrieved 2012-10-02. ^ "Cultural Facilities in Patras". Infocenterpatras.gr. Archived from the original on 2011-10-05. Retrieved 2012-10-02. ^ 19/01/2010 13:46 (2010-01-19). "Παραδίδεται το έργο της ανάπλασης της Αγοράς Αργύρη - Οικονομία - The Best News". Thebest.gr. Retrieved 2012-10-02. ^ "Abex Timber Manufacturing". Abex.gr. Archived from the original on 2011-09-03. Retrieved 2012-10-02. ^ "Vianex facilities in Patras". Vianex.gr. Retrieved 2012-10-02. ^ "Nireus Aquaculture". Nireus.gr. Archived from the original on 2011-03-16. Retrieved 2012-10-02. ^ "λκμκ αρχιτέκτονες μηχανικοί - Βιομηχανικοί χώροι - Εργοστάσιο Παραγωγής Ιχθυοτροφών στην ΒΙ.ΠΕ. Πατρών". Lkmk.gr. Retrieved 2012-10-02. ^ "Kepenou mills". Tovima.dolnet.gr. Archived from the original on 2008-12-07. Retrieved 2012-10-02. ^ "Acciona Wind Parks". Acciona-energia.com. Archived from the original on 2009-01-14. Retrieved 2012-10-02. ^ "Glafkos Hydroelectric Power Station". Dei.gr. Retrieved 2012-10-02. ^ "Intracom Telecom: Infrastructure". Intracom-telecom.com. Retrieved 2012-10-02. ^ "Corallia Innohub". Archived from the original on 2014-03-29. ^ "Patras Science Park - Hosted Companies". Patras Science Park. Archived from the original on 2008-12-05. Retrieved 2012-10-02. ^ "Awards of the 7th International Venture Capital Forum" (in Greek). Retrieved 2012-10-02. ^ "Industrial Systems Institute". Isi.gr. Archived from the original on 2007-09-27. Retrieved 2012-10-02. ^ "Institute of Chemical Engineering & High Temperature Chemical Processes". Iceht.forth.gr. Retrieved 2012-10-02. ^ "Institute of Biomedical Technology". Inbit.gr. Retrieved 2012-10-02. ^ a b "Συμπόσιο Ποίησης". Poetrysymposium.gr. 2012-07-18. Retrieved 2012-10-02. ^ "Patras Final Report" (PDF). Europa.eu.int. Archived from the original (PDF) on 2006-03-25. Retrieved 2012-10-02. ^ "Patras Future Report". Europa.eu.int. Archived from the original on 2006-05-04. Retrieved 2012-10-02. ^ "Πολιτισμός". e-patras.gr. Archived from the original on 2012-07-28. Retrieved 2012-10-02. ^ George Xenides. "Παμπελοποννησιακό Εθνικό Στάδιο Πατρών". Stadia.gr. Retrieved 2012-10-02. ^ ΟΛΠ - Στατιστικά στοιχεία (in Greek). Archived from the original on 2008-04-04. ^ Οργανισμός Λιμένος Πατρών - Το νέο λιμάνι (in Greek). Archived from the original on 2007-01-26. ^ "Patras' New Port in Operation | Greece.GreekReporter.com Latest News from Greece". Greece.greekreporter.com. 2011-07-11. Retrieved 2012-10-02. ^ a b "Πως θα έρθετε". e-patras.gr. Archived from the original on 2013-02-17. Retrieved 2012-10-02. ^ "Works under construction in the region of Western Greece". Ditikiellada.gov.gr. Archived from the original on 2009-02-23. Retrieved 2012-10-02. ^ "Road Axis Patra - Athens - Thessaloniki - Evzoni". Hellenic Ministry of Public Works. Archived from the original on 2012-02-13. ^ Council of Europe (2011). "Intercultural city: Patras, Greece". coe.int. Retrieved 22 May 2011. ^ Градови партнери [City of Banja Luka - Partner cities]. Administrative Office of the City of Banja Luka (in Serbian). Archived from the original on 2011-09-17. Retrieved 2013-08-09. ^ a b c d e f "Patras Municipality - Fraternize Cities". Patras Municipality. Archived from the original on 30 July 2012. Retrieved 4 June 2011. ^ "Online site translation into English and other languages – Yandex.Translate". translate.yandex.com. Retrieved 6 September 2017. ^ Makris, A. "Russian Sailing Ship Docks in Patras for Twinning with Kaliningrad - GreekReporter.com". Retrieved 6 September 2017. Wikimedia Commons has media related to Patras. Wikivoyage has a travel guide for Patras.